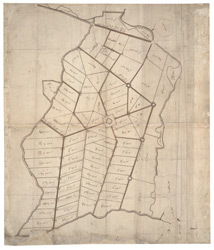 This plan shows a projected settlement near Calais, divided into allotments, with the admeasurements on each, and with roads and forts marked out. It was drawn in 1541 by the surveyor Richard Lee. At this time Calais was English territory. It is thought that Henry VIII himself suggested the walled settlement as a defensive strategy against the French. This is one of the first plans drawn to scale by an English man although it does not feature a scale bar. The land for the projected settlement had been recently drained and is divided into plots ranging from 30 to 200 acres. A house is planned on each and a church occupies a central point, which could have served as a place of refuge in case of attack. The plan is particularly interesting as notes of compass directions along the main roads reveal the precision with which it was surveyed. Nothing came of this scheme which is medieval in its layout.